The Funny Parts includes a chapter on blackface routines. 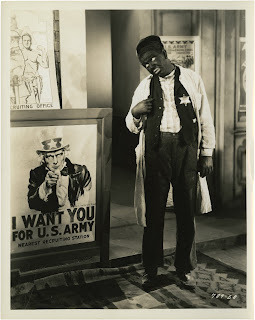 This is undoubtedly a sensitive subject and, in writing about blackface caricatures, I couldn't help but consider the harm caused by the unfriendly portrayal of groups in films. I have personally been affected by ethnic stereotypes. I live in a town where Italians are few and far between. When The Sopranos was at its peak of popularity, I had people calling me "Tony Soprano" or telling me to "fuggedaboutit." They thought they were having harmless fun, but I was made uncomfortable by the comments. I did not like that I, as an Italian-American, was being associated with Mafia stereotypes. I am not the only person stung by Italian stereotypes. The MTV reality show Jersey Shore was recently protested by Italian-American advocacy groups for its negative portrayal of Italian-Americans and the repeated use of the ethnic slur "Guido." Last week, I was sitting in the waiting room of a doctor's office while an episode of Jersey Shore was being loudly broadcast on a flat-screen television mounted on the wall beside me. As the cast was engaged in one of their ridiculously overheated arguments, a black woman sitting across from me kept giggling. Eventually, she turned to a companion and said, "They are so Italian." The racist portrayal of German soldiers in Inglourious Basterds (2009) is vicious, calculated and unapologetic. Hollywood filmmakers have felt for a long time that Nazi war crimes grant them boundless license to denigrate the German people. I grew up in a quiet suburb during the sixties. My family was the only Italian family in a predominantly German neighborhood. At the time, movies inundated me with horribly evil German characters. These films made me paranoid of my neighbors. I lived in terror of the lanky Mr. Vesely. His grim expression, ramrod posture and measured steps convinced me that he was a former SS officer. What was to stop him from acting like Rolf in The Sound of Music and turning my family in to an underground remnant of the Third Reich? How did I know he wasn't going to join forces with the Otto Preminger-looking Mr. Hoffmann to install a line of barbed wire around my home? If Steve McQueen couldn't jump a barbed wire fence using a Triumph TR6 Trophy Bird motorcycle, I doubt that I could jump the fence with my Schwinn Racer. No one is safe from negative stereotyping. I was active in a fathers’ rights organization a few years ago. We were trying to get the message out that fathers are competent and loving parents and they deserve equal standing with mothers in child custody cases. Meanwhile, CBS television, with its line-up of "dumb dad" sitcoms, was sending out the message that fathers were bad parents. Ray Romano tries to make dinner for the family and he sets the kitchen on fire. That may have been a funny scene in 1955, but we live today in a nation where we are segregated into competing political factions. No one can afford to have one of their own depicted in a degrading way on prime time television. It is sometimes necessary for a writer to trim clutter from a book to drive account and analysis from point to point in a clear progression. Still, I do not have it in me to simply discard material and forget about it. A & E can check with me if they ever want to do a series about word hoarders. So, I figured to loosely connect a few odds and ends from my forthcoming book into a passably coherent blog article. I hope that this information will be of some value. It was not uncommon in early films for a human replica - a mannequin, a statue, a doll or a scarecrow - to suddenly come to life to create mischief. It could be no more than a fleeting gag or it could be the departing point for a series of amusing complications. The title says it all in the case of the 1901 Pathé Frères comedy The Statues on a Spree. Often, a dim-witted man provoked the figures to life by a bad or thoughtless act. 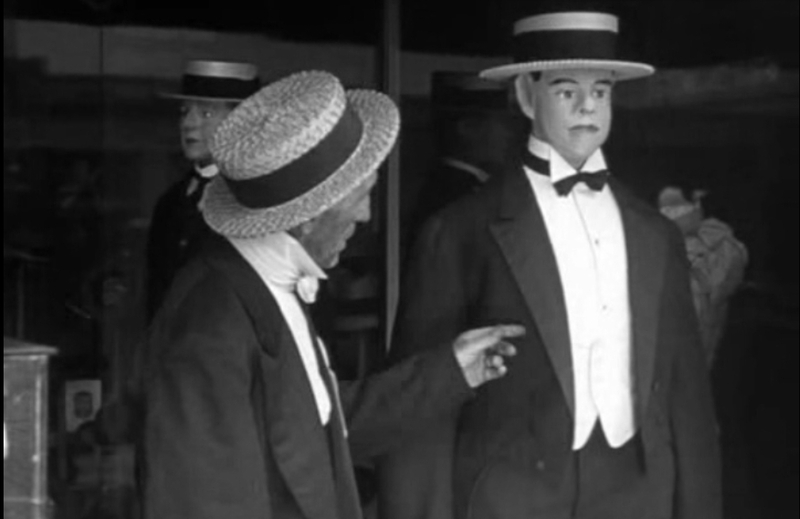 Typical was a 1903 Pathé Frères comedy entitled Mannequin vivant (translated as Living Dummy), in which two men having fun beating up a mannequin are startled to find that the mannequin is willing to fight back. This tradition carried on in sound films. A pair of statues is not at all pleased when Harpo Marx fires a gun at them in Animal Crackers (1930). 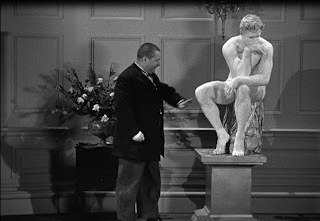 In Three Sappy People (1939), Curly Howard is startled when he smacks a Rodin's Thinker in its knee and the statue responds by booting him in the stomach. A surrealism often creepy in nature dominated early films whether the objective was comedy or horror. This allowed motifs to develop in parallel within these genres. Just as easily as the Rodin's Thinker kicked up a leg, a wax figure of Jack the Ripper sets after a man with bloodthirsty intent in Waxworks (1924). These magical transformations did not come with strain or sentiment in comic situations, but a fantasy/ horror film in which a scarecrow turned into a man did convey a tragic sense. The film, Feathertop (1913), was a Kinemacolor adaptation of a 1852 short story by Nathaniel Hawthorne. The plot has to do with a witch who, in a jealous desire to harm a beautiful young woman, transforms a scarecrow into a handsome nobleman and arranges for the faux nobleman to win the woman's heart. The witch returns on the day that the couple is to be wed to revert the scarecrow to its true form. A Moving Picture World critic stirred by the film's climax described it as follows: "Poor Feathertop passes in front of the mirror, where, to his horror, and that of the girl, he sees his true reflection — not the exquisite dandy, but the scarecrow, clothed in rags. He rushes home to his creator and denounces her. . . We see him gradually fade into a scarecrow, which sways and topples to the floor, a heap of wood and straw." 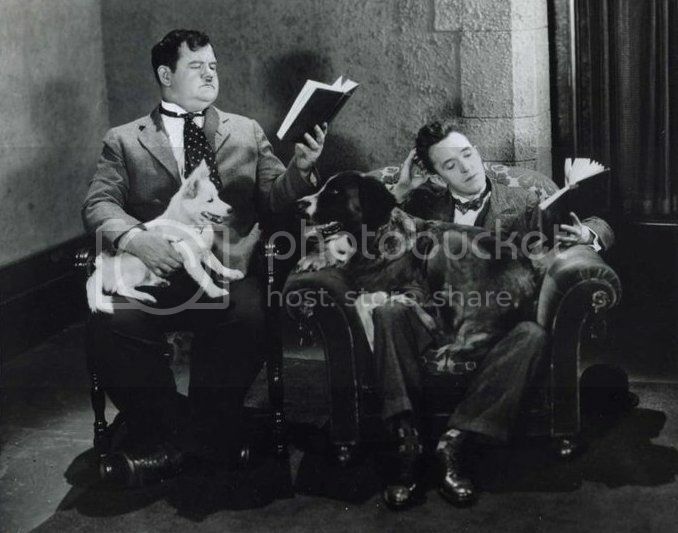 The story, in its style of fantasy and sentiment, was well suited to the film form as it existed at the time, which is evidenced by the fact that a total of five film adaptations of the story were produced between 1912 and 1923. 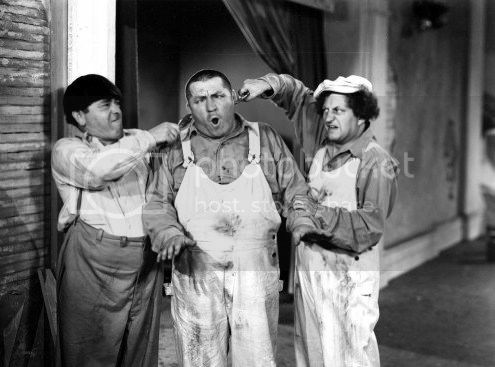 My research turned up a number of premises shared by comedy films and horror films alike. A dissident mirror reflection, which was famously used to make people laugh in Charley Chase's Sittin' Pretty (1924) and the Marx Brothers' Duck Soup (1933), was also used to frighten people in Georges Méliès' Cagliostro's Mirror (1899). The film was short and simple. A man is startled when the image of a beautiful woman suddenly appears in his mirror. The woman beckons to the man and, when he comes closer, she transforms first into a skeleton and then into an enlarged visage of Satan. One corresponding premise stands out for being the most strange. The Statue of Fright, a 1913 Eclipse melodrama, begins with a man hiring a sculptor to create a statue for display at his upcoming wedding celebration. The man is unaware that the artist is the father of a young woman jilted by him the very same day. The woman, heartbroken, acts to take her own life and ends up dying in her father's arms. At the wedding celebration, the groom is happy when the statue is delivered and he gathers around his guests for its unveiling. He pulls off the covering only to reveal the corpse of his jilted lover. 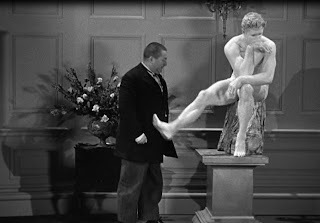 This morbid statue-for-corpse swap would hardly seem to be material for a comedy routine, but a similar concept was introduced in the Larry Semon comedy Dummies (1928). Semon must find a way to escape a gang of thugs about to break down a door to get to him. He pretends to be so distressed that he is willing to resort to suicide. After making it sound as if he is killing himself, he arranges a mannequin under a sheet to look as if it is his corpse. The living mannequin routine was divested of its fantastic elements in the 1908 Gaumont comedy The Dressmaker's Surprise. 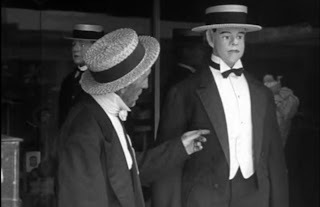 In this instance, a dressmaker's son encloses himself inside a mannequin so that he can fool patrons into thinking the mannequin has come to life. This type of routine became more common as the surreal elements of early film diminished. More often, it was to conceal their presence from an adversary that a character took the place of a mannequin or a statue. 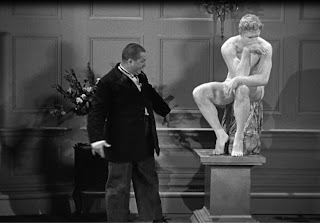 An example of this was provided by Nothing Matters (1926), in which Lloyd Hamilton eluded a murderous Chinatown gang by posing as a Buddha statue. This routine, which was performed by nearly every major comedian, is explored in depth in The Funny Parts. A detached mannequin head or limb could in many ways create confusion in a comedy. This type of routine turned up in Bombardiers (1919). Sydney Chaplin looks to be getting frisky with a woman sitting next to him in the way that he is holding her leg in his lap. But, suddenly, the woman stands up and departs without the leg, which is actually a leg that belongs to a mannequin.